Chicago Pneumatic reports the ATEX directive consists of two EU directives describing what equipment (ATEX 95: 94/9/EC) and work equipment (ATEX 137:99/92/EC) is allowed in an environment with explosive atmosphere. Since July 2003, organisations in EU (and many other regions) must follow the directives to protect employees from explosion risk in areas with an explosive atmosphere. The new ATEX directive (2104/34/EU) became mandatory for manufacturers and operators on 29th April 2016 and is stated in article 44 of the directive. 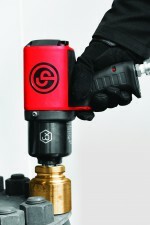 Chicago Pneumatic says it offers its users safety with for example the CP6748EX ½” Atex Impact Wrench that delivers a maximum torque of 1085Nm delivered at 1,200BPM, equipped with the CP ‘Twin Hammer’ in oil bath steel housing for extended life cycle. Also Atex Certified IP6 DUST-PROOF.